- Publisher The Donut Man (Rob Evans) has been spreading his family-friendly values for over 20 years. He uses loving songs and simple stories to teach children the timeless Word of God in a way that's fun and meaningful for them. He's also been honored with an Angel Award, and a Dove Foundation "Family Approved" Seal. Rob and his wife Shelley have six children. Ages 3-10 After School The Donut Man, Duncan, and Mary start a new branch of the Donut Repair Club at a Christian academy. Songs include "Love Letter," "Look To The Ant," "We're Gonna Have A Party," and more. The Repair Shop Kids learn the basics of salvation at the Grand Opening of the Donut Repair Shop. Songs include "God Is The Master Builder," "Two Houses," "I'm Going To Repair A Place," and more. 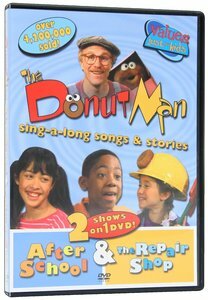 About "After School & Repair Man"
The Donut Man (Rob Evans) has been spreading his family-friendly values for over 20 years. He uses loving songs and simple stories to teach children the timeless Word of God in a way that's fun and meaningful for them. He's also been honored with an Angel Award, and a Dove Foundation "Family Approved" Seal. Rob and his wife Shelley have six children. Ages 3-10 After School The Donut Man, Duncan, and Mary start a new branch of the Donut Repair Club at a Christian academy. Songs include "Love Letter," "Look To The Ant," "We're Gonna Have A Party," and more. The Repair Shop Kids learn the basics of salvation at the Grand Opening of the Donut Repair Shop. Songs include "God Is The Master Builder," "Two Houses," "I'm Going To Repair A Place," and more.